The Pinnacle is the biggest truck build by Mack and was especially designed for long haul applications. The Mack Pinnacle was built on the company’s Advantage lightweight chassis which gives it a strong character and generous payload capacities. The truck features a very comfortable interior and is available with both single and sleeper cab configurations. For enhance versatility, the Mack Pinnacle also offers the possibility of removing the sleeper box of its sleeper models. The truck is available in axle forward and axle back configurations and is offered with a choice of strong and efficient MP engines. The exterior design of the Mack Pinnacle is well put together and gives it solid stance. Moreover, the conventional cab configuration enhances the truck’s aerodynamic abilities, while the slippery raked hood further reduces the drag coefficient. 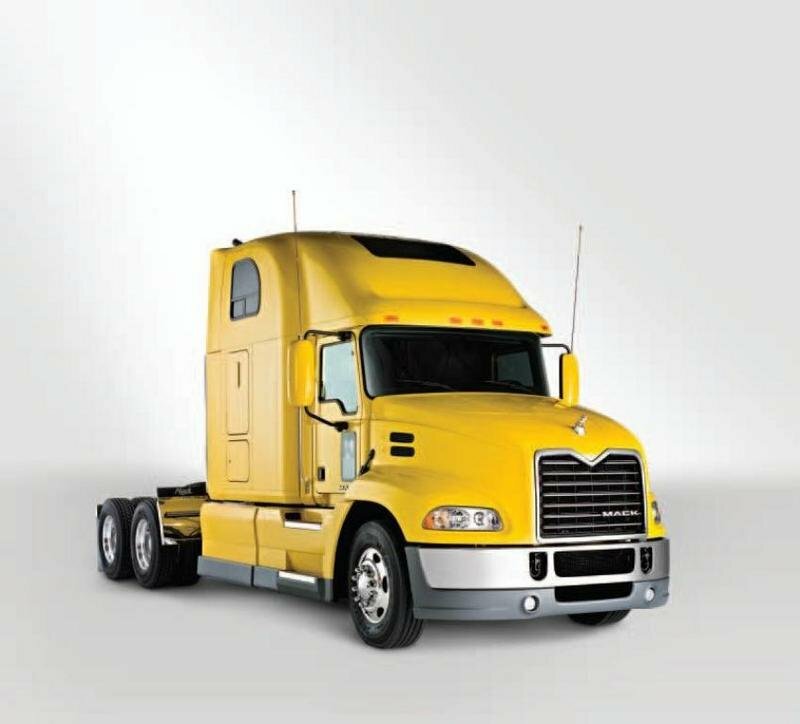 The Pinnacle can be instantly recognized as a Mack truck, thanks to the family grille that dominates the front fascia. We also like the famous Mack bulldog which sits proud on the bonnet and gives the truck a distinctive look. The light clusters are seamlessly integrated into the oversized wheel arches and feature LEXAN headlight covers which are impact resistant and offer easy access for replacing bulbs. The ultra resistant bumper is designed with dual tow clevises, and is also equipped with two small fog lights for better visibility. To have a longer life, the truck’s steel cab was galvanized and is also mounted on airbags and shocks and feature stabilizing sway bars, to enhance the driver’s comfort. grab bar mounted outside. Once inside you’ll find one of the bets interior in the class. 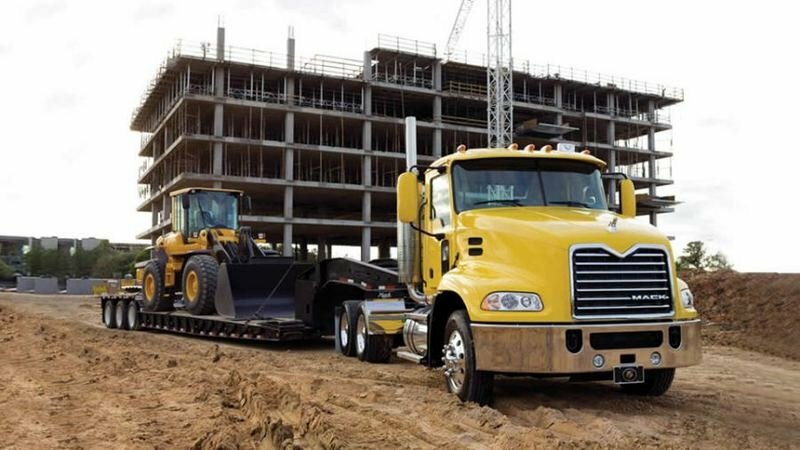 The overall appearance and the build quality are part of the high class and we also like the materials which look better than what you’ll usually get from a highway truck. and easy to understand, despite its numerous gauges. The truck is also equipped with a Co-Pilot driver information display placed above the main gauges which can be controlled pretty easy using a four-button steering-column stalk. The display has 50 screens that provide real-time fuel economy and trip data, detailed maintenance and fault summaries, and supplemental sensor readings. Despite its utilitarian nature, the Mack Pinnacle is also offered with the optional Navion R5000 and T7000 navigational radios which feature a 7-inch, color LCD screen mounted into the dash. The system integrates entertainment, navigation, a blind spot camera display and vehicle, trip and tire-pressure monitoring systems. If you choose this optional equipment you’ll also get an AM/FM/weather band radio, CD player, digital inputs for MP3 players and USB memory devices, and a satellite radio controller. We’ll have to admit that te steering wheel is among the most attractive units in the segment and can be easy adjusted using a floor mounted pedal. We also like the air-suspended driver’s seat which is fairly comfortable and big, with proper back and side support and plenty of useful adjustments to help you get cozy behind the wheel. Moreover, in the superior trim levels the seats can be also covered in leather. Needless to say that the all-round visibility is part of the high class and thanks to the generous windshield, the big door windows and the optimized dash design you won’t have any complains in this department. The Mack Pinnacle is powered by the MP Engine Series which offers plenty of torque at low rpms and cope great with the utilitarian nature of the truck. 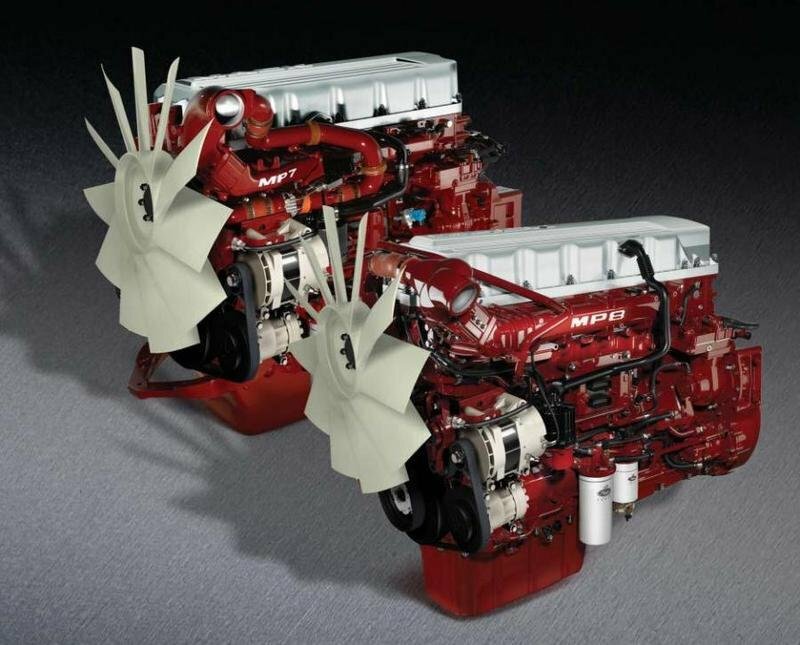 The MP engines develop between 325 – 505 hp. Both the MP7 or MP8 units can be mounted on the axle back models, while the axle forward models are only available with the MP8 engine. To be more reliable, the MP Engine Series was designed with fewer parts that a usual engine and features one-piece steel pistons and stronger bearings and cylinder heads. For better performances, both units come with the electronically controlled Variable Geometry Turbochargers which use advanced technology for cooling the turbo and the actuator. In order to make the trucks more fuel efficient Mack uses the SCR (selective catalytic reduction) system which is incorporated into the engines. The Mack Pinnacle is also available with PowerLeash engine brake which enhances the truck’s stopping power and offers a quicker downshifts if is combined with an automated transmission. The engines can be mated on the company’s Maxitorque ES transmission which features a unique triple-countershaft design, multi-speed reverse capabilities, standard, one-piece aluminum casings and various PTO mounting options. There are also available the Mack mDRIVE automated manual transmissions for any Pinnacle model. Depending on the applications, there are different axle options available for the Mack Pinnacle including, Camelback, Walking Beam or MaxLite air suspensions. Front axles and suspensions are available from 12,000- to 14,600-lb. capacity while rear axles and suspensions are offered from 38,000- to 46,000-lb. capacity. For a greater versatility, the truck is also offered with a choice of four rail sizes ranging from 6 mm to 9.5 mm and a variety of crossmembers. To reduce the under- and over-steering effects, Mack equipped the Pinnacle with a standard Road Stability Advantage designed by Bendix which uses the ABS to improve the truck’s handling. You won’t have any major complains about the steering either, as the chassis offers a pretty tight turning radius thanks to a wheel cut of up to 50 degrees. The ride is also fairly good and is at par with its rivals as the large, outboard-mounted air springs provide proper cushioning, stability and reduce vibrations. 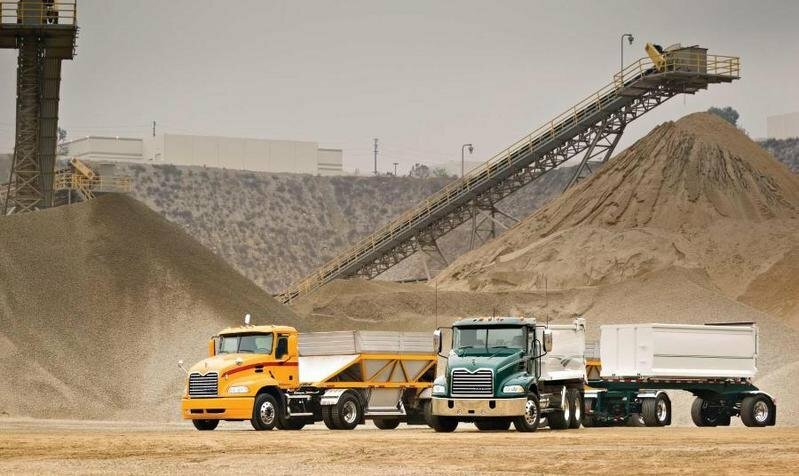 The Mack Pinnacle can sit proud among the best trucks in its class. It features a superb build quality with elegant and comfortable sleeping cabs. The truck’s ergonomy is also first class, while the all-round visibility is top notch. The engines and transmissions are also up to the task and can deal effortless with any big payloads. Furthermore the truck is offered with a host of useful systems and heavy duty suspensions which improve its handling and offer a smooth and comfortable ride.